Half of the NBA season is now complete and this Spurs team doesn’t appear to be any closer to championship form than when the season began. The amazing disappearing act of Richard Jefferson would rival even the great David Blaine. The only thing that is more amazing is how an entire 14 man roster can pull off the same trick in complete unison. Predictably, even in the wins, the entire Spurs roster will inexplicably disappear usually resulting in a humiliating come from behind loss. The San Antonio Spurs are at a crossroads and can’t figure out which way to go. The top teams in the East have been heralded for the past few years as the best in the NBA; destroying opponents, beating them into submission, and completely demoralizing everyone who dares stand in their way. Unlike a decorated war hero tried by fire and proven through adversity, the East sits comfortably atop a fluffy down pillow of little duckling competition. The Eastern conference boasts a whopping 6 out of 16 teams over .500. If the playoffs started today the 7th and 8th seeds would be occupied by teams with losing records. The bloated records the fat four (Celtics, Cavaliers, Magic, Hawks) possess, leave them as the only Eastern Conference teams with records better than 5 games over .500. The Celtics and Cavaliers play big bully to two conferences, combined they only provide one other team with a winning record, the very confused Toronto Raptors. Orlando resides in a division with Atlanta, Charlotte, and Miami all boasting winning records. It’s like buying a ’99 Dodge Neon, then outfitting it with a huge spoiler, custom paint job, and ground glow. It looks great but it’s still a piece of crap car. Nice rims. I think the numbers speak for themselves. Looking west the picture is not so perfect. The Lakers are the clear favorites, no argument there. Once you clear the mountain, the next three teams are only separated by one game Dallas, Denver, and your San Antonio Spurs. Even the injury-riddled Portland Trailblazers find themselves with a better record than half of the East playoff teams. The Spurs do not live as lavishly as our neighbors from the East. The only division in the NBA where every team has a winning record is where we call home. Dallas, Houston, New Orleans, and Memphis all compete for the top spot in the Southwest Division. The Wild West is home to 11 teams that have winning records, nearly doubling that of the East. I’ll take those battle scars any day. Just one year ago a tiny team, embarrassed and trying to find a new start lands in Oklahoma City. Led by a scrappy group of young ballers, the Thunder have established an identity. They too can run with the best in the East, growing increasingly confident with a win over Atlanta a few nights ago. Manu, Tony, and the ever stable, Tim Duncan, provide a group of weary, but tested veterans to lead this team; while Hill, Jefferson, and Blair provide a great backdrop for future success. The one thing that seems to be thriving in OK has all but evaporated in San Antonio, IDENTITY. 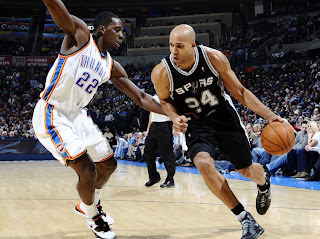 This identity crisis seems to rest mostly on the shoulders of Richard Jefferson. A proven scorer and supremely athletic, he seems more concerned with offending teammates, than he does with simply playing his game. This crisis is evident team wide with an increase in turnovers, a losing record on the road, and a losing record against +.500 teams. The Spurs need to decide who they are. The window of opportunity is slowly passing. Tim Duncan is still playing great, as Pop has been able to rest him extremely well the first half of this season. The core group continues to get older, a fact that is softened by the rise of some younger talent. We have a couple of years with this squad, if not this year, maybe next. Like many of you, I don’t want to wait until next year to see another Championship Parade floating down the river in San Antonio. The Spurs need to take a hard, long look in the mirror. It is decision time. Know this, whatever they decide, there is a chance for redemption down the road, but if we continue to just stand indecisively at the crossroads, we’ll never get anywhere.